As part of the claim for an increase in Pay for Work Train Controllers on the Crossrail Project, working for VGC, the RMT have lodged the following case to support an uplift in salary. We look forward to more detailed talks in support of our claim. In our contract (see an example enclosed), the job role was clearly stated as a COSS/MC/CC. When we resumed for work we’re informed by Mick Bowles (former senior RMC) that our role will be that of a Worksite Train Controller, contrary to the role of COSS/MC/CC which VGC had informed us, and this is what we have been doing since then. 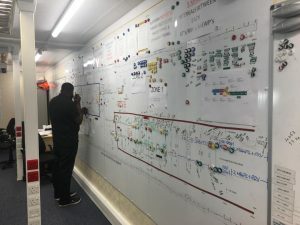 The role Worksite Train Controllers are currently carrying out at the ATC System wide Crossrail Project in Plumstead, is at a higher level than the role of an Engineering Supervisor (ES). We man a 24km worksite (Eastbound & Westbound Roads), setting up dozens of work areas. In these work areas, we control the movements of Engineer Trains, Road Rail Vehicles, Mewps, other types of mechanised plants & vehicles and human personnel. We field at least 2,500 radio calls per shift from personnel seeking to access our worksites to set up their individual work areas as depicted in the attached photograph as a typical example. The big RED, YELLOW, GREEN and BLUE studs detonates TRAINS, RRVs and MEWPS, while the small white, red and black studs represent charge hands (Personnel) all working within the worksite which we have to constantly be in contact with on the system wide radio throughout our 12 hours shift. We are responsible for the safety critical role of setting up safe systems of work to all these Charge hands, who set up work areas and all work together seamlessly without incidents on a daily basis. The calls that come through are of an extremely large volume, relentless and the pressure is intense. We have also recently carried out Competent Persons training. This training is to enable us work together with Senior Authorised Persons (SAP) to set up Safe Systems of Work to facilitate the safe working of charge hands under isolated Overhead Line Equipment, once the energisation takes off and we go back to the trace. As Competent Persons, we will have the additional responsibility of accessing Low Voltage Switch Rooms and High Voltage Substation Rooms if required. We will be responsible for receiving and clearing both Low & High Voltage Permits to work. We will supervise working parties carrying out work under isolation and receive and clear Circuit State Certificates, to implement safe working practice at all times. The role of a COSS does not involve the role we have been carrying out here at ATC System wide; also for the record, the role of a MC/CC would involve being responsible for only the machine I’m working with, at any one time. These include but not limited to what we listed in our grievance letter.